NOTE: This product is a 3-pin addressable LED strip. Please ensure that your motherboard has an addressable LED header before purchasing. 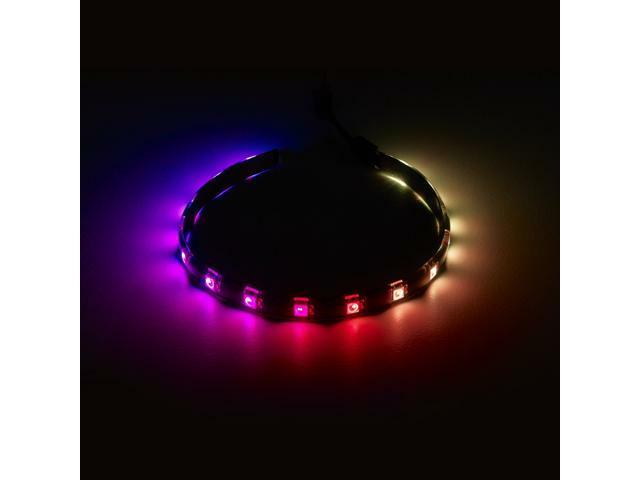 Like our other LED strips, CableMod Addressable LED Strips are fully chainable, allowing multiple strips to be connected together. This item is covered by CableMod Return Policy. Pros: Can't say much here because i order the wrong one. It has 3 pin headers and the adapter does NOT adapt it to 4. I guess a pro would be that cable mod said the would give me a 25$ credit. But thats only for their website only and they were out of stock and shipping was spendy. Cons: I think it should be labelled that the adapter is for a 3 pin to a 3 pin. Obviously if id have known it wasnt going to work i wouldnt have ordered it. Not really a con so to speak but usually do a decent bit of research and i couldnt find any reason why it wouldnt work. Other Thoughts: Probably a great strip if your motherboard or.lighting setup uses 3 pin headers, knocking off 2 eggs just because they should really clarify. Other Thoughts: I'd recommend this if looking to pazzaz your build. This specific strip had 15LED's. Use an extension cable for Addressable LED to connect it to mobo. My motherboard included one. THIS NOT NOT INCLUDE A CABLE TO CONNECT TO MOTHERBOARD. (At least mine didn't) You connect the one connector provided (Asus cable adapter) to the extension cable for Addressable LED (This is the cable I connected to mobo. It works amazing. Cons: The only issue I have with these, and I have a few of these kits, is the connection cable that connects one strip to another. It is only about 3" long and is very easy to disconnect if you move the strips. I personally bought some 30 cm LED extensions to replace the one that come in the kit. Other Thoughts: As for Aura compatibility I have a few of these strips running off of an Asus Maximus X Code so I can say for 100% certainty that they do work but there is a process to it. First you have to make sure your Asus motherboard has the Aura add header, only the newest ones do. I honestly dont know when they included the header on the boards, generationally speaking. You can tell if your board has them by looking at the Aura headers and see if you have any that are 4 pins wide but only has three pins in the header, two on the left and one on the right; it should also be labeled on the board near the header. My board for instance has two standard Aura headers and two add Aura headers. If your mother board does have the Aura add header then it will also have an add extension cable, you need to use that cable regardless of the length you need because it is also an adapter. You plug the Asus add extension cable into the motherboard header, then plug the Asus Aura adapter that comes with the CableMod kit into the Asus add extension cable. Then you can plug the CableMod strip into the CableMod adapter. You will also need to set the number of LEDs in your chain in the Asus Aura software, they should still work without this step but the lighting effects wont be accurate. The 30cm kits have 15 LEDs per strip by the way, so the 4 strips I have running in series have 60 LEDs and 60 is what I put in the settings in the Asus Aura sofware. Other Thoughts: BEFORE BUYING, make sure your Motherboard ACTUALLY has an Addressable Header Port, the standard header port will not work for this product. I do beleive Cable Mod has come out with a 3pin to 4 pin adapter to allow it to work with the standard 4 pin RGB Header. I did not need this as my motherboard has an addressable header port. Cons: - Led lights dont even turn on! - The included support phone number does not work. - No instructions were included with the product. 6 out of 26 people found this review helpful. Did you?